As dawn breaks, two queues start forming at the only petrol pump in Lakshmangarh, a small town in Rajasthan’s Alwar district. One, obviously, is of people waiting to get their vehicles’ fuel tanks refilled. The other is in front of a simple metal box mounted on the petrol pump’s boundary wall. People like to call it ATM machine. But instead of dispensing cash, it gives them clean drinking water. On her turn, 26-year-old Sapna Jatav takes out a plastic card and holds it in front of a sensor of the water ATM. The sensor reads her card and shows a balance of Rs 130. Jatav places a 10-litre container below a pipe on the water ATM and presses a button. Reverse Osmosis (RO) processed water starts flowing from the pipe. Jatav releases the button when the container is full. The machine calculates the quantity of water dispensed and deducts the amount from her account. One litre costs 50 paisa. The technological initiative, powered by solar energy, is changing the lives of many in Rajasthan, Gujarat and Madhya Pradesh. Earlier, people depended on the saline municipal water or groundwater that has high fluoride content. “Water was not fit even for cooking,” says homemaker Rekha Atolia. “Tea would get curdled. Dal would not cook if baking soda was not added to it. When relatives would come, we would buy bottled water,” she says. A study conducted last year by Jhunjhunu-based JJT University states that fluoride content in Alwar groundwater is between 2 parts per million (ppm) and 7 ppm, much beyond WHO’S permissible limit of 1 ppm. High fluoride in water is responsible for increasing cases of renal failure in the district, says the study published in Global Journal of Pharmaceutical Research in September 2012. The technology is the brainchild of Piramal Foundation, the corporate social responsibility branch of global business conglomerate Piramal group. Dharamveer Singh, sales head of Sarvajal, the company started by Piramal Foundation, shares the journey of water ATM. “In 2008, we were brainstorming possible technological solutions to the problem of contaminated water. We also wanted to reduce the drudgery of women who travel long distances to fetch water,” Singh reminisces. Sarvajal started with door-to-door supply of RO water. An RO plant was set up in Jhunjhunu’s Bagar village. But problems started cropping up soon. “Different people would give different delivery times. With little staff this was difficult. Also, door-to-door delivery involved manual labour, which we wanted to reduce,” says Singh. Another problem was of delayed payments. To solve these issues, Sarvajal thought of water ATM and pre-paid cards. V1 has a water tank kept locked above the machine. The tank is connected to the RO plant, which uses groundwater for processing. The plant can process 1,000 litres in an hour. Processed water is carried to the tank using booster pumps. V1 has three buttons—of 1 litre, 5 litres and 10 litres. People could scan the card on the ATM’s sensor and press the button, depending on their water requirement. The problem with V1 was that many a time a lot of water would get wasted because there was no standard size of containers that people brought with them. So, if a customer pressed the five-litre button and the container’s size was 4.5 litres, half litre would go waste. There was a social problem as well. One big village in Rajasthan has two or three smaller villages, called dhani, based on the nature of the community. If water ATM was installed in one dhani, people of other dhanis would object. The advanced model of water ATM took care of the two issues. To avoid clashes, the new model is strategically placed so that it can be accessed by people of all communities. The machine itself is simpler with just one button. The technology uses GSM, or Global System for Mobile communications. It helps Singh keep track of all the 20 machines installed while sitting at his office in Jaipur. A software called Soochak informs Singh on his mobile phone of damage in any machine. For example, if the percentage of Total Dissolved Solids (TDS), a kind of water impurity, crosses the permissible limit, the RO plant would automatically stop functioning and Soochak would alert the operator. Singh claims the system is so sophisticated that he is alerted even if a pipe starts to rust. Every machine is also checked properly once a month, he says. Sarvajal claims to recharge the wastewater produced during the RO process. “Groundwater here has high TDS content. Processing leaves 50 per cent water with TDS content,” says Singh. This water is sent back to the aquifers through recharge wells. D C Garg, hydrologist at the district groundwater department, says this process may increase the TDS content in groundwater. But Anuj Sharma, chief operating officer of Sarvajal, argues that only 0.5 per cent of the extracted water is used for drinking. Most is used for agriculture, shows groundwater extraction data. The operation of water ATMs is managed through local partners. “The idea is to promote local entrepreneurs,” says Sharma. In Lakshmangarh, petrol pump owner Abhir Modi manages the operations. So far, he has around 550 customers who either come to the ATM or get water delivered at their doorsteps. “We have only one water ATM in the village, so people who live far prefer to get it delivered at their homes,” says Modi. The charge for home delivery is 70 paisa. Modi sells around 700 litres of water every day. In summers, the requirement goes up to 1,000 litres. “It is better to drink clean water than spend money on medical treatment later,” says Atolia. Sarvajal now plans to set up one more machine in the town. It is a profitable business for the company as well. The total cost of setting up the RO plant with the machine is around Rs 5 lakh. Franchisees pay 40 per cent of their earnings to the company. If the franchisees own the machine, they pay 20 per cent of the earnings to the company. A unit breaks even when it serves 125 families with 20 litres each daily. The company provides maintenance, advertising support and community drive. “We do not say that we provide the best solution, but this is the best we can do in the existing circumstances,” says Sharma. Surprisingly, the district collector and other officials in the groundwater department know nothing of water ATMs. With no government initiative to tackle the problem of contaminated water, such an entrepreneurial venture is a big hit. Congratulations to the reporter and the the team of Sarvajal for providing clean and drinkable water to the people of the targeted area. The name of "Water ATM" attracts the people with better access. The process of RO is well established and it is positive that the required power is supported by solar power system. It is expected that the cost is less compare to the money people spend on the medicine. The two statements made in the article like: "It is a profitable business for the company as well" and "We do not say that we provide the best solution, but this is the best we can do in the existing circumstances,Ã”Ã‡Ã˜ & to recharge the wastewater produced during the RO process by sending back to the aquifers through recharge wells" results for alarming signal. â”¬Ãº In spite of the availability of clean water, how many poor people can afford? This needs an alternative with community based interventions. â”¬Ãº Sustainability of such process and reaching the unreached needs to be planned systematically involving all the stakeholders. â”¬Ãº As stated, "it is profitable business for the company?". Then it is not for the people in general and it is a business solution. â”¬Ãº Recharging the wastewater of RO process back to the aquifer through recharge wells will affect groundwater which is already affected by salinity or fluorides. â”¬Ãº Have any attempts been made to minimize the severity of salinity or fluorides? Rain Water Harvesting (RWH) may help to enhance the water resources both at surface & subsurface, and to control salinity / fluoride. â”¬Ãº The use of Geological and Geophysical tools including GIS will help to map the water resources and its assessment in terms of quantity, quality and measures to be taken to preserve & protect from all possible pollutants. â”¬Ãº Collaboration with the local groundwater department may help to get better solutions with better availability, accessibility and affordability (3As). The beginning with water ATMs is very good and needs to be planned more systematically with sustainable interventions. 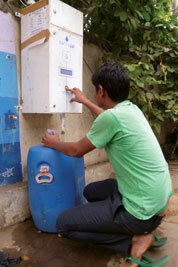 This is a wondefull idea of dispensing clean water at 50p a liter through ATM card. We wish to have one at our petrol bunk at Anakapalle, Visakhapatnam Dist., Andhra Pradesh. Please provide us the address of the company who supplies the RO. An excellent idea. Good use of technology to meet local community needs. I hope this venture expands through out India and the rest of the world. Good inititative and ppp model will help upscaling this. Also capital cost may go down in the long-run. I like this. We want to harvest rain water to supply the community but also give back some of the water we pump from the community well. This innovation can be very helpful to our plans. Is it ready for Africa now? Indeed a novel attempt to provide safe drinking water. But reverse osmosis runs the risk of demineralisation of water . How this problem will be addressed? The approach might be a good business solution and also to facilitate safe drinking water. However, the process of discharging the wastewater into the Recharge Pit should be stopped. Because, eventually it will end up with even more TDS in the raw water. In the long run, it might exceed the capacity of the RO plant as well. Rather the the rain water may perhaps be utilised for such recharging. Lastly, a community based large Water Supply Scheme may perhaps be initiated to facilitate safe water to the households for drinking and cooking purpose and till then this approach should be continued as a short term measure only. They are absolving government from its responsibility of providing clean and safe drinking water, BTW Disadvantages of reverse osmosis is that they are very inefficient. They waste large quantities of water and can need extensive maintenance. It is estimated that for every litre of water they produce, two to three litres are lost. That is a seriously poor rate and a tremendous waste of a precious resource. No doubt the method sounds novel as we have such buzz words like ATM,prepaid card etc. People with western thinking and orientation are ignorant of the realities in rural areas of developing countries. Can this system work? Is it sustainable? Even simple Box Type Solar Cooker could not penetrate in Rural areas which is more than 60 years old. Only 6 lakh units sold(but not all of them used). What is the fate of solar panels at signals? In India the major problem is dust accumulation on the solar panels. Who undertakes regular cleaning? Even regular ATM(Cash) ,there are many cases of theft. Is the WATER ATM Fool Proof? How much quantity it can meet? There is a notion among planners and western educated that, RURAL IS BAD,URBAN IS BETTER AND FOREIGN IS THE BEST. It is not at all valid in many cases in India. Technology is culture specific. There are many water purification technologies available which are simple and can be readily adoptable in rural areas. One such method designed, demonstrated and disseminated is SOLAR DISINFECTION OF WATER. Impure water is the root cause for many diseases especially in developing countries. waste water. In 6 hours when the ambient temperature was 30 degrees Celsius, the unit eradicated 3 log 10 (99.99%) of bacteria contained in the water samples. The unit will provide about 6 liters of pure drinking water and larger units can be fabricated for providing safe drinking water at community level in developing countries. water to the people has been a major challenge for Governments in developing countries. solution poses a safety hazard (2,4,11). usage rendering lesser transmission of sunlight. 600C for one hour has the same effect (2,21). quite high (2500 hours sunshine per year). safe drinking water is paramount, especially for the developing countries. the unit to be placed according to the latitude of the place for maximum solar insolation. through the bottles a second time, to both increase exposure and eliminate shadowing. This reflection system will increase the light intensity minimum 2 times. for E.coli, enteric bacteria, and rotavirus; and 650C for hepatitis A virus (3,6,8,9,10,16). temperature above 500C in the elimination of pathogens. an hour and the seed are available in plenty in forests in India besides being inexpensive. Plate Technique has been used. the innovative device I developed. It can be readily seen that is complete with my device compared to open. and waste water samples in 5 hours. year and as such this innovative solar disinfection unit will be a boon in this region. Science and Technology, Government of India. Supply Res. Technol.AQUA 43: 154-169(1994). inÃ”Ã‡Ã˜naturalÃ”Ã‡Ã˜ water purification.Photochem. Photobiol. 24: 49-57(1976). fresh and saline waters. Appl.Environ.Microbiol.68: 1122-1131(2002). disinfect drinking water sources,Water Sci Technol.43: 255-162.
the bacterial inactivation process, J.Appl. Microbiol.84(6),1138-1148(1998). tissue culture method. J.Med.Virol.14: 277-283(Abstract)(1984). Reflectors, Applied and Environmental Microbiology, 65, No.2,859-861(1999). Hi Sir I want to get franchise of water ATM. Plz do the needful on imdt basic.